Glasses are becoming such a fashion statement lately and I am loving it. What I am not loving is my lack of new glasses! We are lucky to get vision insurance, but it only pays for frames every other year. Two years is a long time to wait when you like options! It's even worse when instead of eyeglasses, I got prescription sunglasses last time. Yeah, my frames are old. But with the price of prescription glasses who can afford to get them more often? See how else I've worn this vest here, here, and here! When I found out you could get new glasses with prescription lenses for as low as the price of a typical sweater or pair of jeans I was sold! GlassesUSA.com generously offered a credit to their store for me to get a badly needed new pair. There were so many options it was a tough choice, but I finally picked the perfect pair with the help of their virtual mirror feature and absolutely love them! It was very easy to enter my prescription information and I received an email at each stage of the process. I received my glasses really quickly; about a week and a half after ordering them. For the price and the quality, it is the perfect place to buy glasses! There is no need to be worried about buying something you can't actually try on either. There is a lowest price guarantee and a satisfaction guarantee. You can even join their referral program! There are lots of promotions going on to help lower the price even more. You can check on the current promotions at the Coupons and Promotions portion of the website. 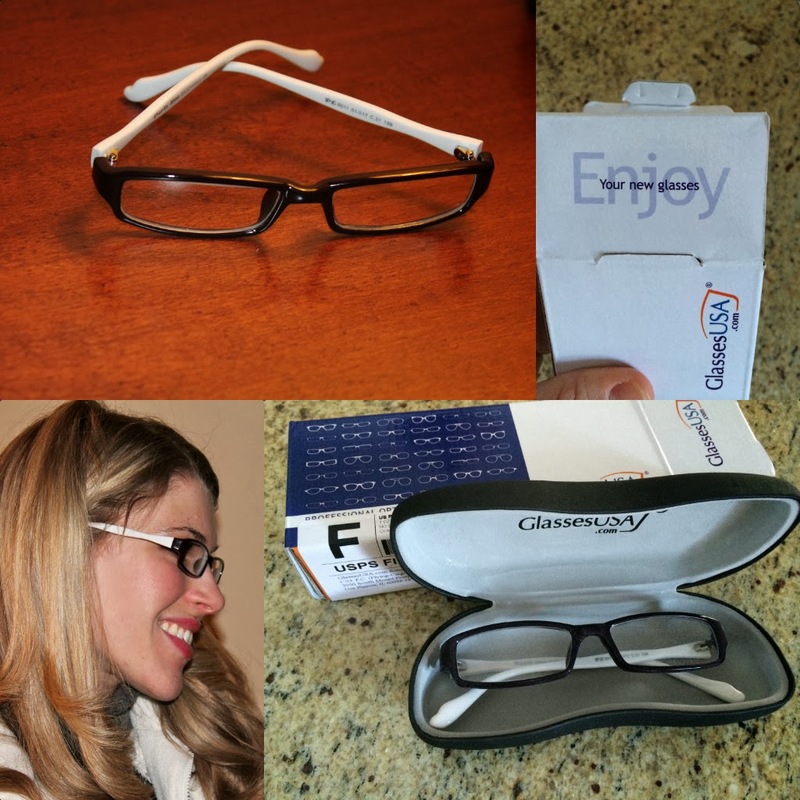 GlassesUSA is offering 10% off any order with the code Blog10! Try on some glasses yourself with the help of their virtual mirror below. I was provided with a credit to Glasses USA to purchase glasses in exchange for this post. However, all opinions are my own. i love the online glasses stores...they make it so much easier to get cute glasses! these ones look great on you! I had no idea you wore glasses. You are the cutest nerd. One of my new Puffer Vests that I thrifted is identical to yours, except Yellow. I even checked the other links of how you styled this Vest lol. Those glasses are super-cute on you! I love the black and white! Thanks so much for linking up with Mix it Monday! Your new glasses are really cute! I love the black and white. You look adorable in glasses! I love the two colors on these, very modern! I've never tried them before, but I am really pleased with the result! And it's so much cheaper, too! Haha! Thanks Ada! I wear glasses for driving and in school to see the board. I bet your yellow vest is adorable! Those frames look pretty good on you! And I really like your sweater! I love the glasses! They look fab on you. When I was 8 I tried to fake an eye test because I wanted glasses so bad. I didn't work though. Poop. You are too cute! As someone who has worn glasses since I was four (!!) I love to see when they are styled in such a chic way! Also, I'm jealous at how you can pull off the puffy vest!! It looks so cute each different way! Haha! That cracks me up! I keep thinking about lasik, but then I wouldn't be able to wear my glasses, so I guess having bad vision has some positives! Those glasses are way cute! Sometimes I wish I needed glasses so that I could use them for a fashion statement...but then I remember how expensive they can be! cute new frames! I love your white vest, it just looks so cozy! they look great! and so do you! They can be! I was shocked these were less than $50! those glasses suit you perfectly! Typically I really like to try them on, but was pleasantly surprised with the whole process. It's nice to have options with glasses or contacts! I think you look cute both ways! Aw, thank you Laura! I used to prefer myself without glasses, but I have gained a lot of weight in the last few years due to some medical things I'm battling, and I think my glasses are a better scale for my puffier face these days...but I also know I'm pretty insecure anyways, haha.